That’s why we’ve built an app that lets marketers know when important things change in their business. And today, we’re excited to announce that we’re giving marketers free early access to Databox. There’s nothing worse than feeling like you’ve missed an opportunity to optimize, or realizing that you didn’t see quickly enough when something went wrong. But now with Databox alerts you can get a heads up when something important changes suddenly. Want to make sure you know if conversion rate drops below a certain threshold? No problem — get a push notification or an email sent to you right away. Need to keep an eye on website traffic to see if something changes suddenly? We’ve got your back. We know that the metrics that are important to you might not be the same ones that are important to your boss or peers. That’s why Databox lets you customize exactly what you want to see and how you want to see it. You select from the metrics that are most important to you – and you can change your views, adjust your alerts, or add new KPIs anytime you need to. Find yourself checking your phone from bed or over your coffee first thing in the morning to see where you stand? It’s ok – we do it too. 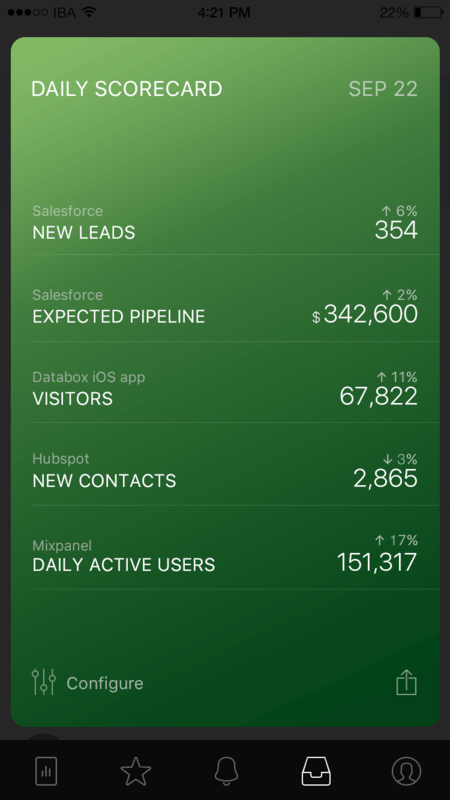 Now with daily scorecards you can have a snapshot of your most important metrics delivered right to your phone, whenever you want it. And of course, what’s in your scorecard and when you get it is completely up to you. Forget checking three different apps to see your marketing funnel! Your scorecards can be a mix of whatever stats you need to keep an eye on – even if they come from different sources. Need to share a stat? You can mark-up any chart and send it to your team, right from the app. Sharing is built seamlessly into Databox, so there’s no more need to text screenshots or email something to yourself before passing it on. Plus, if you want to point something specific out or draw attention to a particular data point, you can draw or write right on the chart before sending so everyone knows exactly what you want them to see. We know the last thing you need is another tool that requires development support and lengthy integrations. That’s why we’ve made it our top priority to make sure getting started with Databox is a breeze. We’ve built one-click connections to Google Analytics, Adobe Analytics, Salesforce, Hubspot, Optimizely, Mixpanel, and Localytics — with even more coming soon. That, combined with our easy 4-step setup, lets you get up and running with Databox in minutes — yes, minutes. All you need to do is select the data source you want to connect to, pick the metrics you’d like to see, authenticate with your credentials, and then set up your alerts. Voila! The bottom line is that there are so many great tools for marketers to manage all the levers that can help drive growth these days, but it’s not so easy to know what really deserves your attention and when. That’s where Databox can make a real difference. We’ll keep an eye on your most important metrics and tell you when something has changed and really needs your attention. Think Databox might be right for you? Request an invite to our exclusive early access program to see it for yourself! And as always, if you have feedback or questions, we want to hear from you! Drop us a line at hi@databox.com or tweet @databoxHQ and we’ll get back to you just as soon as we can.